We’ve long been of the opinion that a perfect night out often includes dinner and a great show. The Massey Theatre can always help provide access to the show, but dinner remains a challenge for us. This month, we have a solution! We are tres enchante to be hosting Royal City Musical Theatre’s Cabaret. The show runs from April 12th to 29th. Since opening on Broadway in 1966 the show remains a devastatingly relevant work of art and continues to be both entertaining and unsettling. Based on a book written by Christopher Isherwood, Cabaret is set in 1931 Berlin in the seedy glamour of the Kit Kat Klub. It’s bawdy Emcee, hard living entertainer, Sally Bowles and a raucous ensemble take the stage nightly to tantalize the crowd and leave their troubles outside. This decadent nightlife takes place during a disturbing time with the collapse of Weimar Germany and the rise of the Nazi Party. 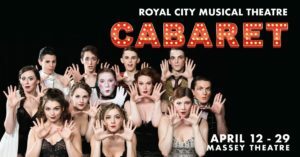 Come hear some of the most memorable songs in theatre history, including “Cabaret,” “Willkommen” and “Maybe This Time” along with dance numbers, a love story, and with an overwhelming wake up call and a reminder to be vigilant, that things can change so quickly that suddenly without you knowing, you’re in a scary world. Come and leave your troubles outside – life is beautiful at the Cabaret – follow your heart while the world loses its way. We’re thrilled that Wild Rice is offering ticket holders of Cabaret 10% off their food and non alcoholic drinks bill during the run of the show. Simply present your ticket or ticket stub at Wild Rice during the run of the show to receive the discount. Kung Po and Cabaret anyone? This offer is only good from April 12th-29th.